Walter Sea at Camper & Nicholsons sends news that he's closed on his listing for sale, the 38 metre motor yacht Heritage III with Chany Sabates at International Yacht Collection representing the buyer. Built by US yard Broward Marine in aluminium to ABS class, she was designed by the yard's in house team and delivered in 2007 as a semi-displacement yacht. Designer Evan K Marshall gave the interior layout a soft hue in neutral furnishings contrasted with dark polished wood panelling and ornate inlays, while large windows flood her with light. The main saloon and dining room are full beam and open plan, with a comfortable seating area, coffee tables and a formal dining area. Alfresco dining is available on the shaded aft deck with steps leading down to the swim platform. There is more outdoor entertaining space on the flybridge, with ample seating, a wet bar, bar stools and a spa pool. Heritage III accommodates 10 guests in five staterooms with five crew. Her full beam master suite forward on the main deck boasts a king size bed while a VIP stateroom is below, also with a king size bed and there are two doubles with queen beds and a twin. All staterooms have en suite bathroom facilities. 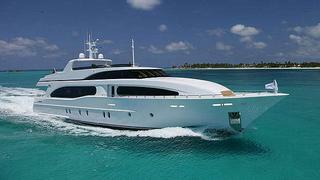 Twin 2,000hp MTU engines give Heritage III a cruising speed of 20 knots and she was asking $7,595,000.